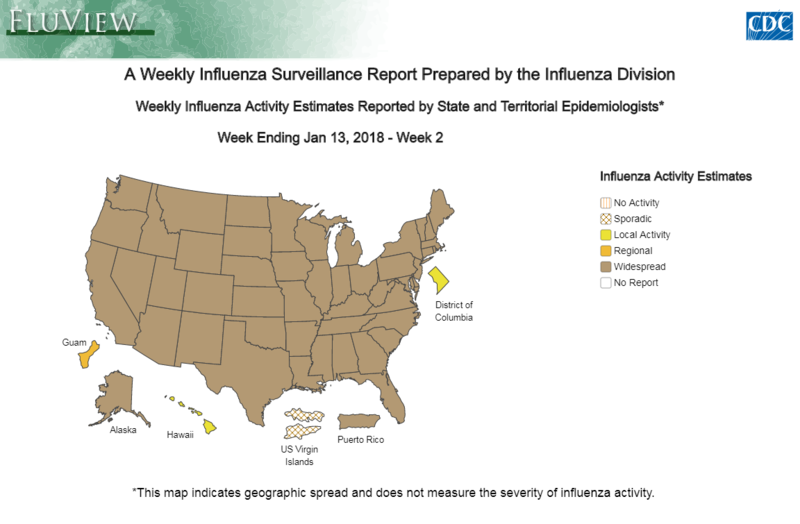 The latest influenza map from the CDC. Dr. Don Milton is a doctor and a professor of environmental health at the University of Maryland School of Public Health, and an author of a study in the Proceedings of the National Academy of Sciences. He and his team found people who are sick with the flu can generate tiny, infectious droplets that can stay suspended in the air – just by breathing. “We developed a special machine for collecting people’s exhaled breath where a person sits in a booth with a cone – that’s kind of like a capture hood over your stove – in front of them. So as they breathe or cough or sneeze or generate particles as they talk, they’re sucked into this machine which is collecting air at 150 liters a minute,” he explains. Milton says they studied people with confirmed influenza infections, and they asked them to come in within the first three days after the onset of symptoms. "We analyzed the data from people who came in one, two or three days after symptoms started and we saw that people were exhaling infectious droplets throughout that period of time, but it tailed off. So it was mostly the first day after symptoms and dropped off on the second and third day," he says. Milton says they cultured the particles people exhaled. "We were able to show they were infectious even when people weren’t coughing or sneezing," he says. But he says they haven't yet observed transmission of the flu by way of those droplets to somebody else. "So CDC would argue at this point that really those tiny particles only matter at close range. And they might be right, I don’t know. But until we can really nail down that transmission occurs through those tiny droplets and how far away that can happen, it’s hard to make hard and fast recommendations about what else you ought to do – should you increase ventilation, should you open the windows? There are many things like that that might make sense, but it’s perhaps too early to make a firm recommendation on that," he says. The bottom line here? Milton says when you’re sick, stay home. You can listen to the interview with Dr. Milton above.